For the past year or so I have been a tiny bit obsessed with tiny homes (no pun intended). About a week ago, I was thinking about how people that live in these small spaces come up with very creative ways to store their stuff. Then I wondered how they find a space for their bikes, as most of the tin homeowners seem to be outdoorsy types, I assumed they would be into biking. This led me to EVOC travel bag. I had never heard of this company before or people shipping their bikes all over the world for that matter. Here are the results of my research, hope you find it valuable. 2 What is a bicycle travel bag? Before I get into the details of the travel bags, I wanted to give you a quick overview of the company itself. According to their website, the founders of the company have been an outdoors adventurers for quite a while now. 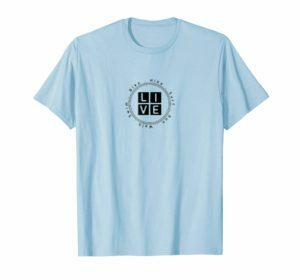 I believe since 1999, they have been hiking and biking all around the world. And just like a lot of other small company stories, they founded EVOC out of necessity. They weren’t satisfied with the bags, accessories they were using to carry their stuff so they eventually decided to do it themselves. Today they have quite a variety of products from backpacks to photo bags to travel bags, from bike travel bags to all kinds of snow-related products. The founders still go on adventures, travel all over the world and in a way test their own products first hand. When you have time you should check out their Instagram page, lots of cool photos from their travels. (Of course there are some “product placements” as well, but that is totally understandable). If you would like to view the company’s website, this is a good page to start. What is a bicycle travel bag? 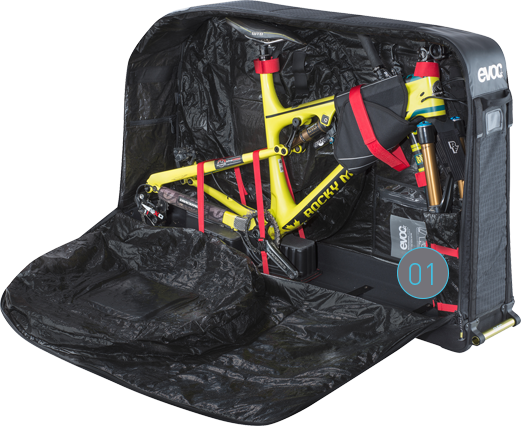 Simply, it is used to transport your bike from one place to another, mostly if you are flying somewhere and you want to take your bike with you. You place your bike into one of these bags, secure it and ship it wherever you are going. You can use the same airline you are flying and process it as an extra luggage (of course fees will apply), or there are even companies that can ship your bike for you to wherever you are going, like Bikeflights.com. 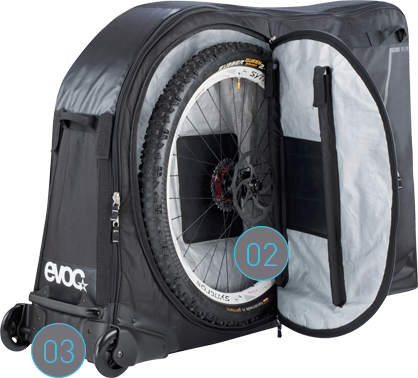 You might also want to use a travel bike bag if you are going on a weekend trip in an RV and you have only one (expensive) bike that you are taking with you and you don’t want your valuable bike sitting on the back of the RV or the car in a bike rack. 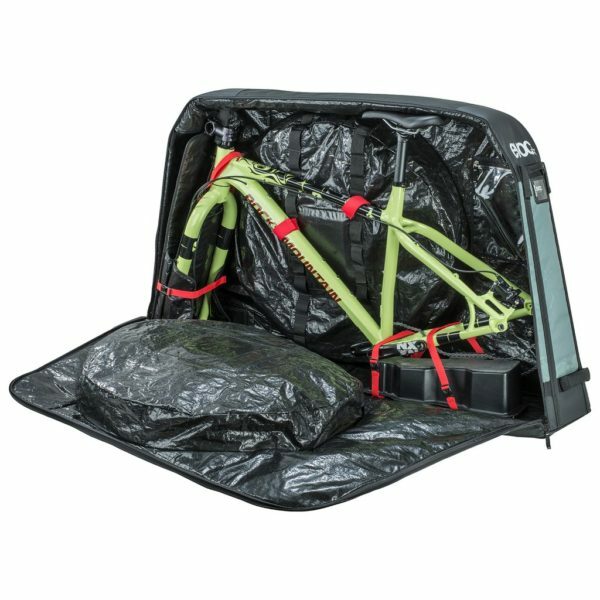 You can easily fit your bike in a bike travel bag, put it inside the RV, or if you have a big enough SUV. I don’t know if anybody uses it this way, but it just seemed reasonable to me so I wanted to share. Before I get into the details, I want to mention, other than the company website, I rely heavily on Amazon when it comes to any product research. The main obvious reason is, Amazon is pretty much the world’s largest online retail store, and the customers are very passionate and eager to share their opinions on the products they purchase. 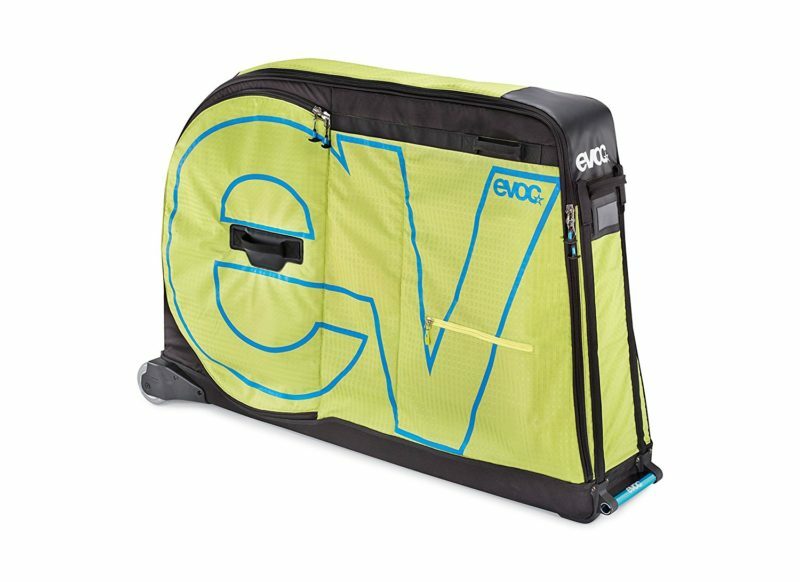 At the time of this article, EVOC bike bag has over 73 reviews with almost a 95% positive (3 stars or higher) feedback. Also, there are over 50 questions answered, which I have read almost all of them so you don’t have to, if you don’t feel like it. Please note, the feedback and question numbers I have mentioned above are obviously subject to change. I am also going to mention two other models EVOC PRO and EVOC XL, just to give you more options, mostly based on size, although in the case of PRO model, the road bike adopter is included. These two models have much fewer reviews compared to the original one, but still seemed to have a very positive feedback. All these bags need you to remove are the handlebar, pedals, and wheels. Certain types of bikes may require additional adjustment to fit in the bag, I will mention that in the FAQ section. Also, the bags, regardless of the model mostly use the same material, they are soft bags. This is the first model that the company has introduced and still seems to be the most popular one. Its internal dimensions are 50.4 x 30.8 x 10.6 inches (128 x 78 x 27 cm). The maximum wheelbase is 48 inches (122 cm). Overall dimensions are 53.5 x 31.5 x 15.4 inches and, weighs about 21 pounds. It fits road bikes, triathlon bikes, XC-, FR-, downhill, 29 inch bikes (more on this later, read FAQ section). 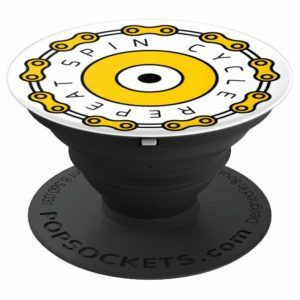 However, for road and triathlon bikes you will need either a road bike adapter, a road bike aluminum stand or a bike stand. All these are sold separately for this model. For easy convenient storage, you can collapse it down to 53.5 x 15.3 x 10 inches (136 x 39 x 25 cm) when empty. There are two separate wheel compartments on the side and has a reinforced fork mount. And last but not least, it has replaceable skate wheels. This is the latest model that the company has introduced at least according to their website. The next model (XL) is only currently mentioned on Amazon, at least when I did my research, I am sure that will be updated at some point. Its internal dimensions are 51.2 x 30.8 x 10.6 inches (130 x 78 x 27 cm). The maximum wheel base is 48.9 inches (124 cm). Overall dimensions are 54.7 x 31.5 x 14.2 inches and weighs about 18 pounds. Yes it is lighter than the original, because of some minor design changes. It fits road bikes, triathlon bikes, XC-, DH-, FR-, enduro, 29-inch bikes. The road bike adapter is INCLUDED. It collapses down to 54.7 x 14.2 x 8.7 inches (139 x 36 x 22 cm) when empty. Again, two separate wheel compartments on the side and has a reinforced fork mount, this one has clip-on wheels. If you would like to take a look at the user manual for PRO you can view it here. Unfortunately there is not a whole a lot of reviews about this model. 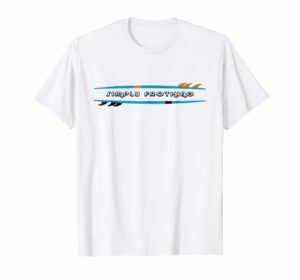 The only one I could find on Amazon.com was 1 feedback at the time and it was a very generic positive feedback. It looks like it is the same as the original but bigger in size. It may be used for a fat bike or a plus size bike. The internal dimensions for XL are 52.7 x 31.1 x 15.3 inches (134 x 39 x 79 cm), weight about 21.2 pounds. Does this fit my bike? This is by far the most commonly asked question about all of these bags. You need to measure the wheelbase of your bike and compare it with the INTERNAL dimensions of the bag you are considering. That is the number one thing to pay attention to. 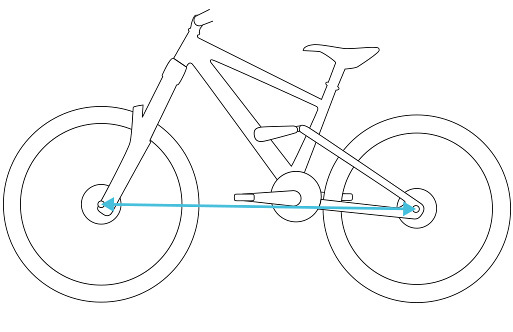 Other than that, the original and the PRO model should fit bikes up to 29-inch wheels. However, to be on the safe side, if you have a 29-inch wheel bike, the PRO model seems to be the better fit. In general mountain bikes fit great without needing an adapter, however if you own a triathlon or a road bike you need one of the adapters mentioned above. Is there a maximum chainring size? Again, a mountain bike with a chainring size up to 56 fits well, however for any other kind of bike you need an adapter. You should check the wheelbase. Also you can “shorten” your bike by dismantling the derailleur. Will my fat bike fit? According to the company, no for the original and PRO. The XL model is for a fat bike or a plus size. You should contact the company for more info on this. Does it come with the frame? Yes, it has metal inserts to make sure the bag is sturdy while transporting. They can be removed when collapsing the bag. The bags have a PU coating which makes them water resistant. However, under heavy rain or any other extreme condition, probably not waterproof. The reason most companies use PU coated material is, it makes the item lighter. Is it safe enough (and strong enough) for a plane flight? Well, almost 99% of the reviews I have read, people who actually used these bags, were extremely positive. According to their feedback, the bikes arrived without any damage and the bags were undamaged as well. 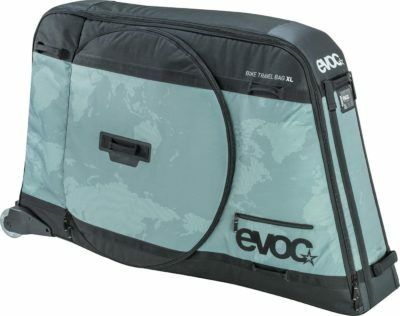 Of course, there are a couple of bad experiences, but overall it seems like these bags are a hit according to the actual customers, some of which used an EVOC bike travel bag for multiple international flights. EVOC has a 24-month warranty. If you would like to read the details, you can do so here. I am always surprised how my curiosity for one subject leads me to learn more things about another subject or in this case, the concept of a bike travel bag which I didn’t even know existed. Based on my research, I think these bags are good decision, if you really need to transport your bike to your new adventure destination. Whether that adventure is a getaway to a mountain bike spot, or a cross-country trip. Especially the original EVCO has enough positive feedback and history, at least for me, to say yes, this would be a good buy. When it comes to using it as a storage solution for a tiny house, why not? 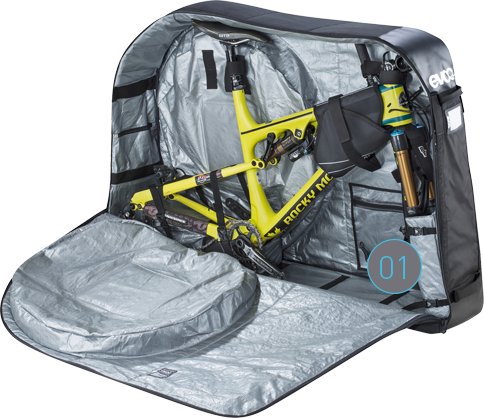 Unless you like to hang your bike from the ceiling because you like that look, these bags give you a very viable option to store it under your bed or any kind of space you can fit it into. In such a tiny space every inch has to be used efficiently and these bags can help. If you are into using things efficiently, check out my blog post about how to use old bike parts. Also, on a separate note, Yardstash has a great compact portable biking storage solution to protect your bikes from heat, snow or rain, check out my review for Yardstash IV here. This entry was posted in Biking, Reviews on July 6, 2018 by ozziewizzard.